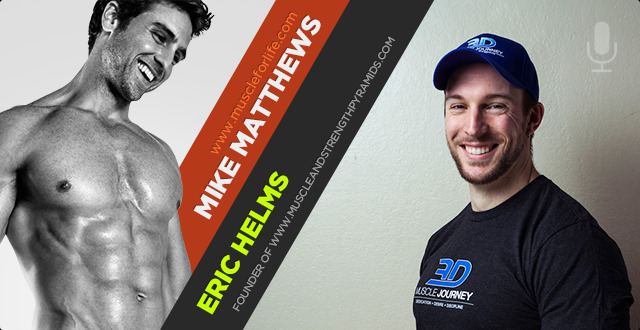 In this episode I interview Eric Helms, who’s one of the premier natural bodybuilding coaches in the game. He’s a member of the 3DMJ coaching team and is himself a professional natural bodybuilder and strength athlete, as well as an author and credentialed scientist with several peer-reviewed publications under his belt. I reference his work quite frequently in my writing, actually, so it was a real pleasure to get the chance to interview him. And as you’ve gathered from the title, this interview is on how to prep for a natural bodybuilding show, and Eric covers everything ranging from caloric intake and macro breakdowns to weightlifting and cardio strategies, supplementation, and much more. So if you’re getting ready to prep for a show or are considering doing one, you definitely need to listen to the interview. It can save you from all kinds of trials and tribulations. And even if you’re like me and have no intention of competing but are just working on building your best body ever, you’re going to get a lot of out this interview too, because the principles Eric talks about apply to everyone looking to lose fat and not muscle–not just competitive bodybuilders. 2:39 – Eric’s background on contest prep and personal experience. 4:15 – What are the biggest contest prep mistakes and myths? 12:14 – Do you need to manipulate water, salt, and potassium? 15:05 – How do you contest prep correctly? 19:41 – What kind of cardio should someone do? 28:51 – Tips on how to recover faster. 33:06 – Tips to maximize your nutrition. 40:32 – What nutrition should someone have on a refeed? 42:56 – How do you determine someone’s maintenance? 50:26 – How do you go about reducing calories? 53:11 – Do you increase exercise throughout the prep? 56:32 – Is there any supplementation you recommend? 1:00:31 – What does peak week look like? 1:05:39 – Where can we find more of your stuff? 5:16 – Eric’s background on contest prep and personal experience. 6:52 – What are the biggest contest prep mistakes and myths? 14:51 – Do you need to manipulate water, salt, and potassium? 17:42 – How do you contest prep correctly? 22:18 – What kind of cardio should someone do? 31:28 – Tips on how to recover faster. 35:43 – Tips to maximize your nutrition. 43:09 – What nutrition should someone have on a refeed? 45:33 – How do you determine someone’s maintenance? 53:03 – How do you go about reducing calories? 55:48 – Do you increase exercise throughout the prep? 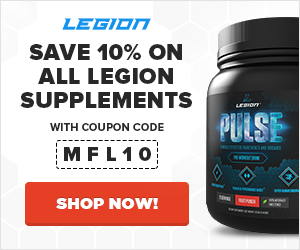 59:09 – Is there any supplementation you recommend? 1:03:08 – What does peak week look like? 1:08:16 – Where can we find more of your stuff?